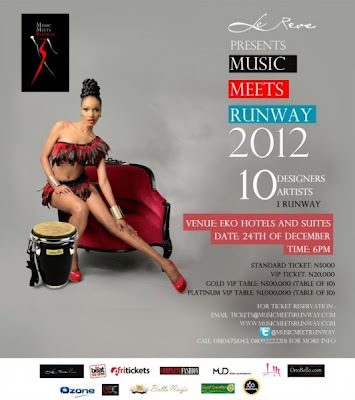 Music Meets Runway brings you 10 Designers and 10 Artistes all on 1 Runway today, December 24, 2012 at Eko Hotel & Suits, Victoria Island, Lagos by 4pm. The event will be hosted by "Mr Entertainer" Dbanj and Supermodel Millen Migese. Regular Ticket costs N5, 000, VIP Ticket costs N 20, 000. 00 and Table costs from N500, 000.